Click here for information on Precision Machining, Screw Machine Parts, Stampings & Moldings. Precision Machining, Screw Machine Parts, Stampings & Moldings. In addition to our standard line of Feed-Thru Terminals, Lundey Inc. is pleased to offer you the highest quality products in these areas at competitive prices and prompt delivery. For a quick response to quotations, requests, or delivery information please call (508) 226-6012. Lundey Ceramic Terminals are designed for applications which may require a liquid or gas-tight seal at low pressures. A variety of sizes from .200 diameter to 1.625 diameter offering flashover voltage (in air) from 4,000 Volts RMS to 36,000 Volts RMS. 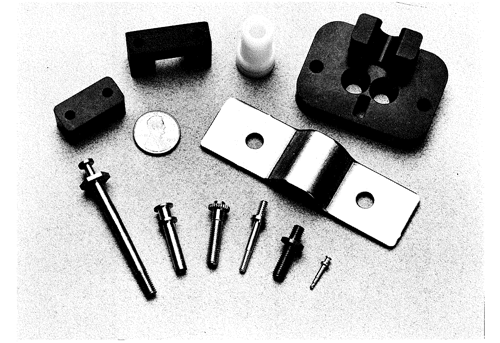 Terminals are insulated Feed-Thrus designed for use in electronic and electrical equipment. Maximum current rating is 8 Ampere and 3,000 Volts RMS (in air). Lundey Eyelet-Style Terminals are specifically designed for use in applications requiring minimal internal clearance. Maximum current rating is 10 ampere and 4,500 Volts RMS. Lundey Swell-Loc Terminals offer a series of low profile insulated standoffs and Feed-Thru Terminals.